Processors are rethinking and improving existing products and make new ones possible thanks to advances in pouch packaging. As sustainability continues to shape packaging R&D strategies, flexible packaging suppliers are emphasizing environmentally friendly end-of-life scenarios for pouches, bags and film wrappers. Prior to the end of its life, flexible packaging offers significant eco benefits. When “you start rolling up the carbon numbers and the greenhouse gases, it takes a lot less to transport and move flexibles” than to ship rigid containers, says Mike Richmond, vice president of consulting solutions at Packaging Technology Integrated Solutions, Downers Grove, Ill. The one sustainability issue that can’t be ignored is most flexible packaging is not recyclable -- in contrast to competitive materials such as paper, steel, aluminum, glass and rigid single-polymer plastics (like polyethylene terephthalate, or PET, which is commonly used to make food and beverage bottles). Thus, suppliers and others in the flexible-packaging industry continue to work on the recyclability problem. One result is the recyclable 100 percent Polyethylene Stand Up Pouch developed by Dow Chemical Co., Midland, Mich. The package provides an alternative to nonrecyclable multilayer pouches. “Dow Performance Packaging recently worked with a customer and brand owner to develop the Polyethylene Stand Up Pouch. Beyond the design’s sustainability and cost benefits, the pouch’s advantages are similar to the traditional stand-up pouch, allowing consumers to easily see a brand’s logo on grocery-store shelves, providing the needed brand identity,” says Nestor de Mattos, group marketing director for North America Dow Food and Specialty Packaging. Ampac, Cincinnati, also markets a recyclable stand-up pouch, the No. 2 Pouch, which is predominantly high-density polyethylene. Ampac currently is developing a low-density polyethylene version of the package called the No. 4 Pouch. Recyclable stand-up pouches can be recycled through bag- and film-recycling programs, the most familiar of which require consumers to drop off the clean, empty packaging at a retail store. Suppliers also are researching ways to reduce landfill-bound waste by, for example, creating thinner flexible materials. They “are constantly looking at how to do a better job to make this more environmentally friendly,” Richmond says. On-the-go convenience, in-home functionality and sustainability continue to stoke processors’ adoption of flexible packaging, creating a proliferation of pouches in supermarket freezer cases, on grocery shelves and even in the wine aisle. Innovative structural design is often the prime mover in delivering these benefits. Such was the case with a recent package development project at Hillshire Brands Co., Chicago. The result of Hillshire’s four-year effort was a new style of microwavable packaging for frozen sandwiches. Called the Heat Fresh Pouch, the package launched this spring in Sam’s Club stores for 12-packs of Jimmy Dean breakfast sandwiches. The package won a gold award for technical innovation in the 2014 Flexible Packaging Achievement Awards competition sponsored by the Flexible Packaging Association. Hillshire’s pouch is a thermoform-fill-seal package that uses a nonwoven film laminate, made from polypropylene and cellulose, on the bottom of the package. The package’s formable top film is a proprietary multilayer structure. Curwood Inc., Oshkosh, Wis., supplies Hillshire with both films. The consumer benefits of the package are greater convenience paired with a better tasting, evenly heated sandwich, the company claims. “There are three main things the package does,” says Jeff Czarny, director of packaging R&D at Hillshire Brands. "It’s a moisture-equilibrating, self-venting, absorbent package for one-step microwave heating.” The nonwoven film is the absorbent component of the package. By venting excess steam and absorbing condensation, the package lets the product heat evenly, with each component maintaining appropriate mouthfeel -- which is a feat, considering the sandwiches include a croissant or biscuit, cheese, egg and sausage. “We always look at how [product] formulation and package interact. That’s what’s so special about this particular packaging launch,” says Martha Cassens, director of R&D at Hillshire Brands. The pouch also improves convenience versus the previous package by making the microwave-heating process faster and much simpler. “We like to say we reduced heating and prep time by 50 percent,” Czarny says. When the products were in the old packaging, preparation consisted of removing the sandwich from the pouch, wrapping it in a paper towel, microwaving it on 50 percent power for 1.5 minutes, flipping the sandwich over and heating it for one minute at full power and finally letting it stand for a minute before unwrapping and eating. Schwan Food Co. itself designed this pouch to bring soft-serve ice cream to home consumers. Product comes out of the package in swirls, and the 8-oz. pouch has a reclosable screw cap. Schwan Food Co., Marshall, Minn., used its packaging ingenuity to develop an unusual package for a new product -- soft-serve ice cream that’s delivered to consumers’ homes via Schwan’s Home Service subsidiary. The package won a gold award for packaging excellence in the 2014 FPA awards competition. Thanks to Schwan’s package design, the product comes out of the package looking like the swirly ice cream parlor version of soft-serve. The ice cream comes in chocolate and vanilla. Nominally a single-serving package, the 8-oz. pouch has a reclosable screw cap in case consumers want to save some for a second serving. Unlike many food pouches, this package has no gussets. The pouch’s “spout has sort of a star shape,” observes Mike Richmond, vice president of consulting solutions at Packaging Technology Integrated Solutions, a division of Havi Global Solutions LLC, Downers Grove, Ill. The custom-designed spout fitment creates a professional-looking swirl when the consumer squeezes the product out of the pouch. But if preparing a cup or cone of ice cream is too much trouble, “you can squeeze the soft-serve ice cream right into your mouth,” Richmond says. The pouch is shaped like an ice cream cone, with a narrow bottom that makes it easy to grip. In addition to making soft-serve ice cream more convenient for in-home consumption, the package design provides operational benefits. In particular, Schwan designed the pouch for filling on existing equipment. That fact, and Schwan’s focus on keeping the package simple and practical in every regard, helped the company get the package to market in less than a year. Technically, it's a bag-in-bottle, similar to bag-in-box wine, except the "box" is shaped like a conventional 750-ml wine bottle. The PaperBoy brand deliveris sustainability benefits plus convenience with its hybrid paper/flexible package. In the wine category, the PaperBoy brand is delivering sustainability benefits plus convenience with its hybrid paper/flexible package. The concept is similar to bag-in-box wine, except the package is shaped like a conventional 750-ml wine bottle. The PaperBoy package consists of a molded-paper shell and an internal liner, or bladder, made of film. A rigid plastic neck fitment is attached to the liner, and the package is topped with a screw cap. The shell, neck and cap are all recyclable where appropriate recycling streams exist. The shell also may be composted, because it’s made from undyed, recycled paper fiber and the labels are printed with inks made from natural ingredients. Ecologic Brands Inc., Oakland, Calif., supplies the packaging. Truett-Hurst Inc., Healdsburg, Calif., makes the PaperBoy wines, which comprise a 2012 Mendocino Chardonnay and a 2012 Paso Robles Red Blend. The package and brand launched nationally at Safeway supermarkets in 2013. The eco-benefits of the package are noteworthy, as is generally true when comparing flexible packaging to rigid. Stranger & Stranger Ltd., London/New York, which designed the PaperBoy package, estimates it is 85 percent lighter than a glass wine bottle and requires 15 percent as much energy to manufacture. The lighter weight translates into less fuel use and reduced transportation-related greenhouse gas emissions. More packaging supplies can be packed onto trucks supplying Truett-Hurst, as well, because the “bottles are stackable like egg cartons,” says Kevin Shaw, Stranger & Stranger’s founder and creative director. When the consumer has finished drinking the wine, the PaperBoy bottle is easy to prep for recycling. The package’s back label provides detailed instructions, with line drawings, to teach consumers how to separate the shell from the liner. In addition to being eco-friendly, the package has several consumer benefits when compared with glass bottles. For example, “you can carry it with you for events that are held outdoors, like picnics,” Shaw says. The package’s light weight makes it easier to tote to the beach or a camp site, and the lack of glass makes it safer than glass for activities like pool parties and tailgating. Plus the PaperBoy package purportedly insulates better than glass. Like Campbell Soup, General Mills created sauces for home cooking. Also like Campbell, General Mills used a flexible pouch with a transparent bottom gusset. In product categories where stand-up pouches have become a familiar sight, flexible packaging is changing more subtly. Kraft and General Mills recently announced that for certain products they will use stand-up pouches that incorporate a transparent bottom gusset. Kraft Foods Group Inc., Northfield, Ill., began rolling out this type of pouch for its Capri Sun drinks in February 2014. Around the same time, General Mills, Minneapolis, announced a new package for its Progresso Recipe Starters cooking sauces. This one, too, is a clear-bottomed stand-up pouch. General Mills’ packaging choice reflects a changing look for shelf-stable sauces as a category. Campbell Soup Co., Camden, N.J., launched Campbell’s Skillet Sauces in a clear-bottom stand-up pouch in 2012. The Progresso Recipe Starters pouches have a shelf life of 12 months, according to General Mills, and each pouch holds 9 oz., or four servings. The product had previously been packaged in cans. The brand owner cites convenience and user-friendliness as primary reasons for switching to a stand-up pouch. 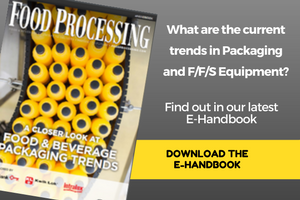 As the proliferation of food and beverage pouches illustrates, flexible packaging is attractive to brand owners and consumers alike. Cost effectiveness, environmental friendliness, convenience and other consumer benefits all contribute to the value proposition. For this reason, flexible packaging will continue to experience stronger growth than other types of packaging, predicts Mike Richmond, vice president of consulting solutions at Packaging Technology Integrated Solutions, Downers Grove, Ill. “Flexibles [are] riding a pretty nice heyday,” he notes.